Amy Fluker, visiting assistant professor of history, will deliver a lecture titled “The Bell Witch of Mississippi: Slavery and the Supernatural” at noon today in the Faulkner Room of the J.D. Williams Library. Amy Fluker is primarily interested in the 19th-century United States, and two of her main focuses are collective memory and the Civil War era. She learned of the legend of the Bell Witch when she was a child, but it was not until much more recently that she became familiar with the part of the narrative that takes place in Mississippi. Fluker recalls an Ole Miss student asking her if the story she told had any connection to Long Branch Cemetery in Water Valley, which the student said locals believed to be haunted by the witch. “I had never heard of it — but after a little digging, I uncovered an alternate narrative of the Bell Witch legend passed down by Bell descendants living in northern Mississippi,” Fluker said. 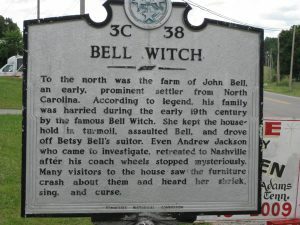 The story of the so-called Bell Witch of Tennessee’s Adams County is well-known. In fact, there is a historical marker in Adams, Tennessee, near what was once the farm of John Bell, the man around whom the haunting allegedly centered. The legend says Bell, his family and his guests were tormented physically and psychologically starting in 1817. The hauntings apparently continued in full force until shortly after Bell’s death on Dec. 20, 1820. After this, few appearances of the Bell Witch were reported. This is the famous part of the story, and it overshadows the portion of the legend that’s set in Panola County. Betsy Bell, the daughter of John Bell, moved to Panola County in 1874 to be closer to her children, and some say the witch followed her. Descendants of the Bells who still live in the area kept this version of the narrative alive. A main focus of the lecture is slavery — a part of the narrative that is often glossed over. However, slaves and slavery are important parts of the story, both because many alleged eyewitnesses were enslaved and because, according to Fluker, slavery underlies the reasons the Bells were supposedly haunted. This intersection of collective memory and the Civil War era makes the topic extremely relevant to Fluker’s research interests. Many people, including former President Andrew Jackson, were fascinated by the Bell Witch during the time the haunting supposedly took place. This fascination continues today. In fact, people can pay to tour John Bell’s farm and a cave on the property. “The Historic Bell Witch Cave” is on the National Historical Registry. Fluker’s lecture is free and open to the public. The Faulkner Room, where it will take place, is on the third floor of the J.D. Williams Library in the Department of Archives and Special Collections.